You can see the current candidates here. To run for one of the elected positions - President, Secretary, Treasurer, Publicity Officer, Social Secretary (x2) or General Member (x3) - you will need to provide a single page manifesto / poster which will be available to be seen by all of our members - so keep it appropriate! Only current MUMS members are eligible to stand, and all members will be able to vote in the afternoon following the AGM (1st March). All manifestos will need to be submitted by 11:59pm on the 28th February. Elections for Vice-President will take place later, to give anyone who didn't get their preferred position another chance. Applications for appointed / interviewed positions (Concert Managers, Communications Officer, Web Administrator, Librarian, Personnel Team & Programming Team) will open soon, but the interviews won't be scheduled until after the elections. A short description of the roles you can stand for follows and more detail on each role can be found in the MUMS Handbook here. 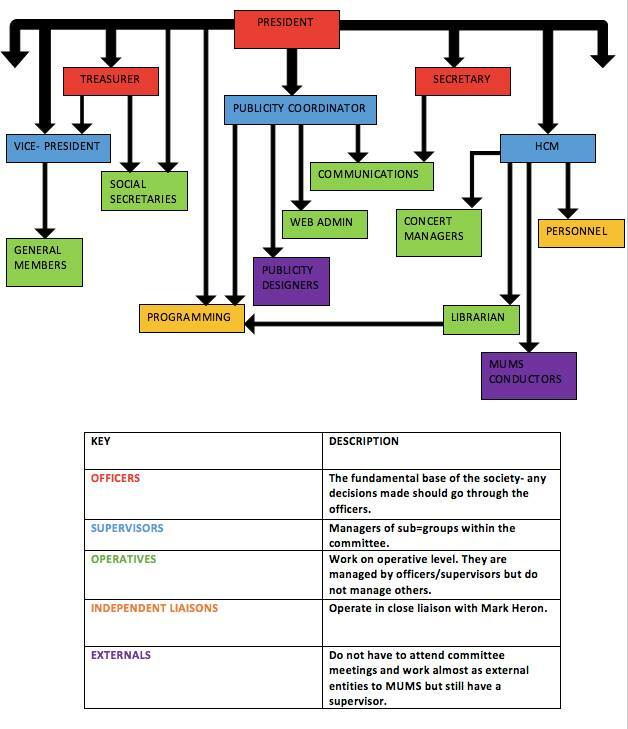 There is also a "Committee Family Tree" that shows how all the roles interact - you can find it here. If you want to know more about any of the roles, do please just email the current committee member - all the contact details can be found on the committee page. The publicity officer is responsible for putting together a team of designers to produce the posters and flyers that advertise all of MUMS concerts and socials. They will need to organise photo-shoots for soloists if necessary, and work closely with the Programming Team to ensure all material is produced accurately and quickly once concert programmes are confirmed. They will also need to organise flyering teams to promote our concerts (such as outside the Bridgewater Hall).